SwimRun Wetsuits are compulsory for most Ötillö SwimRun events, as they are usually held in cooler european waters, typically the ocean around Sweden, Norway, Russia, and the high mountain lakes in Switzerland. 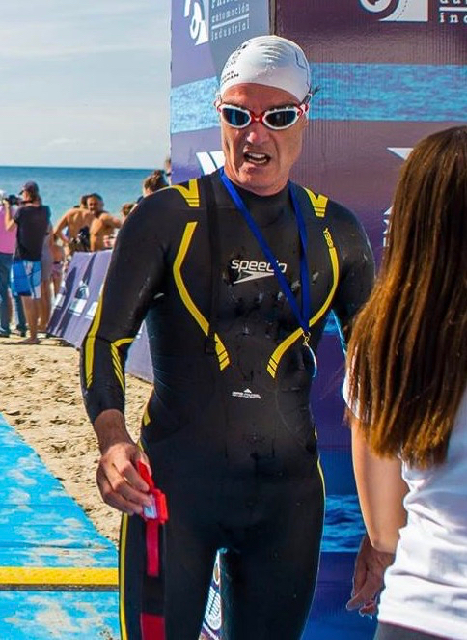 I’m sure there are many other swimrun events around the world where wetsuits are not required, and one I know of for sure is the Bologna, Italy, event at the end of July; triathlon competition suits are required! So, what sort of suit do you need? There are three basic options, based on how seriously you want to take this new sport, and your budget. First option is the suit you already have - assuming you have one! It may be a surfing wetsuit, diving wetsuit, or perhaps a triathlon wetsuit. Of these, the best will be a triathlon wetsuit, because it is already designed for swimming. Other water sport wetsuits will usually be less easy to swim well in. My Triathlon wetsuit, which I decided NOT to cut! 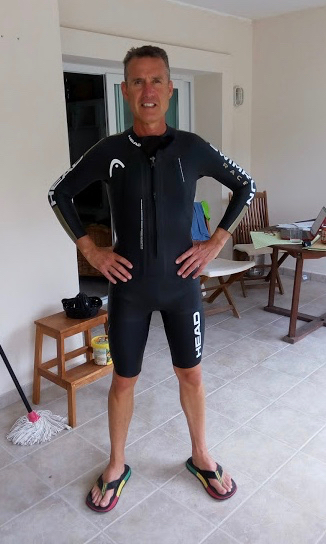 Second option will be to adapt a triathlon wet suit into a SwimRun wetsuit. Why would you want to “adapt” a perfectly good suit? For starters, a triathlon wetsuit is a pretty good place to start; it has extra buoyancy panels designed to help keep you higher in the water, thinner neoprene panels around the shoulders to allow easier swimming, and a rear zip that is usually easy to open. But there are some potential problems. The two main ones are the long legs and that rear zip. The long legs are good for triathlon because they get some neoprene around your calves, which gives buoyancy and helps keep your legs higher in the water. BUT that neoprene tends to wrinkle around your knees, especially behind the knees, during longer runs, and it rubs! I tried this out during the Ötillö sprint race in Hvar, Croatia, and I found out that adding salt water to the mix only makes things worse. SO THE LEGS HAVE TO GO! You have to CUT your triathlon wetsuit legs just above the knees, slightly higher behind the knee, to eliminate that rubbing. You can still use your “adapted” suit for triathlons, but it will have lost a little buoyancy, and allow a little more water in. It will have one advantage, though - in transition it will come off much more easily! Third option is to go the whole hog and buy a swimrun-specific wetsuit. This is a comparatively recent development, and is only available from certain wetsuit companies, although more are entering the filed as the sport grows in popularity. Most will have two zips, one at the front and one at the rear. This feature allows a “staged” approach to heat management during the running sections. The first level is to simply pull down the front zip soon after exiting the water. This lets you expand your chest a bit when you start running, and lets a bit of air in there. After a few minutes of running, especially in summer events, you’ll start to heat up, so the next step is to reach around to the rear zip cord and pull it down. This opens up the whole upper section of the suit, giving you more freedom and more air. But you still have your arms in the sleeves. 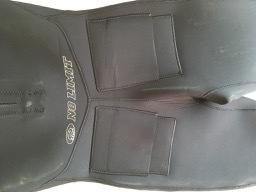 On a 2-zip suit the zips are shorter than the rear-only zip on a triathlon wetsuit. So the top will tend to stay in place OK even with both front and rear zips pulled down. 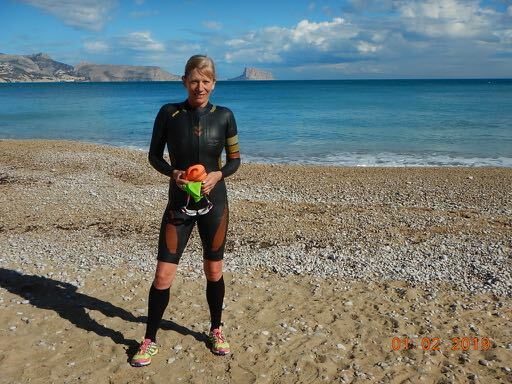 BUT you may still have to do some personal adaptation on a dedicated Swimrun wetsuit! I bought the HEAD Race suit, which come with all the bells and whistles, including long arms and legs. The idea is that you can trim the arms and legs to your own preferences. starting to cut my expensive suit! My SwimRun-specific wetsuit from Head, the "Race" suit. I cut the legs off. BUT HERE IS A GREAT SWIMRUN TIP: You should keep the leg section that you have cut off, and trim it down a bit so it fits comfortably below your knee. You end up with "calf guards" or "calf sleeves". What's the advantage? There are 4 potential advantages here. You have got rid of the annoying neoprene from around your knee joint during the running sections. You can pull the calf sleeves over your lower legs, and get some extra bouyancy for your lower body during the swim sections of the race. You can stuff things down the inside, like a gel or energy bar, in longer races. You get some protection for your calves if swim exits are over rocks. ﻿You will have to experiment with this during training - you may not like it! But many swimrunners DO, especially in longer distance races. Finally, when you begin to boil up (as I did in Croatia! ), you can pull your arms out of the sleeves and run with the wetsuit top down around your waist. This is the “maximum cooling” mode! BUT HERE’S THE TRICK - having two zips makes it WAY EASIER to get your top back on as you run the last 200 - 300metres of any running section. You pull the sleeves the right way through, put one arm in at a time, then reach around and pull the REAR zip cord up over your shoulder. Because the front zip is still open, the rear zip goes up MUCH MORE EASILY than on a triathlon wetsuit! And then you zip up the front zip as you get near the water. 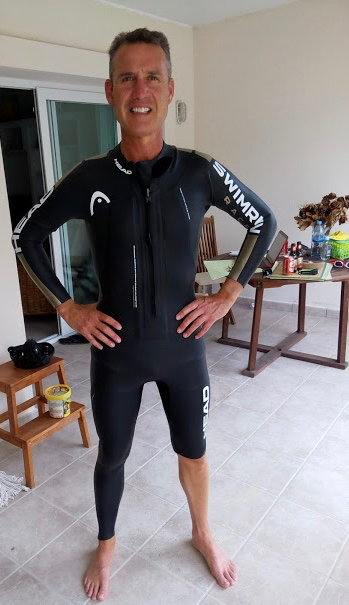 Generally, men have an easier time of things when it comes to getting a SwimRun wetsuit that fits. Even when buying online, most manufacturers help you get the size right by checking your height and weight, and adding the option of “short, regular, or long” fit. But the ladies can find it harder to get a suit that fits well, especially for swimming AND running. The best options here are to buy in a shop, so that you can try on various suits, as opposed to trying to find the right fit online; the top option is to get a suit custom-made. This isn’t as expensive as it may sound. You have to take a lot of measurements, and repeat them several times to be sure, but you end up with a really snug suit. Mogsy had quite a hard time trying to find the right SwimRun wetsuit - it took a while! She ended up with a custom-made suit (ie. made-to-measure). It has essential features like front-and-back zips, and thinner neoprene under the arms to allow for easier swimming. BUT it also has some nice features, such as EXTERNAL rear pockets with flaps. These are much easier to access than inner pockets, which you have to unzip the suit front to get to. It also has a built-in webbing loop at the front, to clip a swimrun tow-rope into. 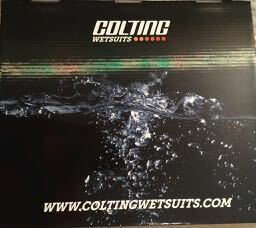 Mogsy decided to look for a more dedicated swimrun wetsuit in January 2019, and discovered a new manufacturer - Colting from Sweden. 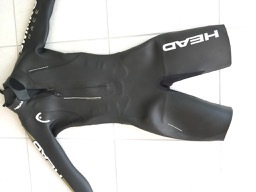 This new wetsuit has all the best features that help in a cold swimrun event - it has long arms, as opposed to the short arms of her custom suit. The longer arms help to keep her warm while swimming in cold waters. Also, the short legs on the suit finish just above her knee - but here's something interesting - the leg didn't seem to seal very well around Mogsy's leg, meaning that water could leak in a bit when she first entered the water. HOWEVER, this feature also means that water can drain OUT relatively easily when she exits the water at the start of a run section. This has proven to be much better than the tight seals on her custom-made wetsuit, which actually held water INSIDE the suit legs when she started to run. The pockets in the new Colting suit are inside, under the arm pits, but without any velcro fastening, which we think is a GOOD THING. We have always found that velcro strips are very difficult to get into with cold hands inside a tight wetsuit! 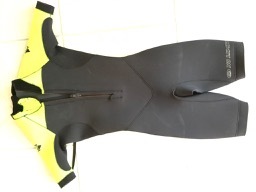 You really need to wear something under your wetsuit, mainly to help prevent chafing when running in wet neoprene. For men, the simplest is a normal swim costume. It could be just classic Speedo briefs, but a lot of men prefer the longer leg style that extends to mid-thigh. Women can wear either a tri suit, swimming 'bottoms' and a sports bra if needed - Mogsy finds the best option is swimming briefs and the Shock Absorber Ultimate Run Bra (the same bra she uses for general running). You can find good deals on this sports bra on Amazon - in many different colours. Hopefully this review of SwimRun wetsuits will help you make a choice as you get into this fun new sport! Which Swimrun Wetsuit are you using? Do you have a Swimrun specific wetsuit? Tell us about it! Don't forget to add where you are from in the world and any event you have done or are training for.